Solar energy is one of the easiest and smartest investments a commercial real estate (CRE) developers can make. A few years ago, investing in solar was often dismissed by property owners and managers as either too expensive and complicated thinking the effort was not worth the financial return. This has changed. Installing a solar photovoltaic (PV) array is one of the best ways to cut utility costs, raise rents and save on common area maintenance (CAM) reimbursements. Solar Energy Saves Money. Period. Since 2001, installed solar costs have come down approximately 10% for Commercial & Industrial (C&I) properties. Between 2017 and 2018, installed solar prices continued a ten-year trend of falling: $3.1/W for small non-residential systems (a $0.4/W or 11% decline), and $2.2/W (a $0.1/W or 5% decline) for large non-residential systems, according to an ongoing study at the UC Berkeley Lab. Attractive Federal and State incentives compound the reduction in energy expenses. The most universal is the Federal Investment Tax Credit (ITC) which is a 30% credit for the system cost. Many states offer other incentives including rebates, renewable energy credits and financing programs that can be used to cover up to 80% of the overall costs. Solar is a building improvement that will raise revenue while lowering operating expenses. Energy represents an average of 19% of total expenditures for the typical office building. A C&I solar project can lower annual energy expenditures between 20 – 40% depending on commercial electricity rates and local incentives. Some states – such as CA, MA, NY, NJ and more – retail electricity prices are much higher, which makes the solar bottom line even stronger. 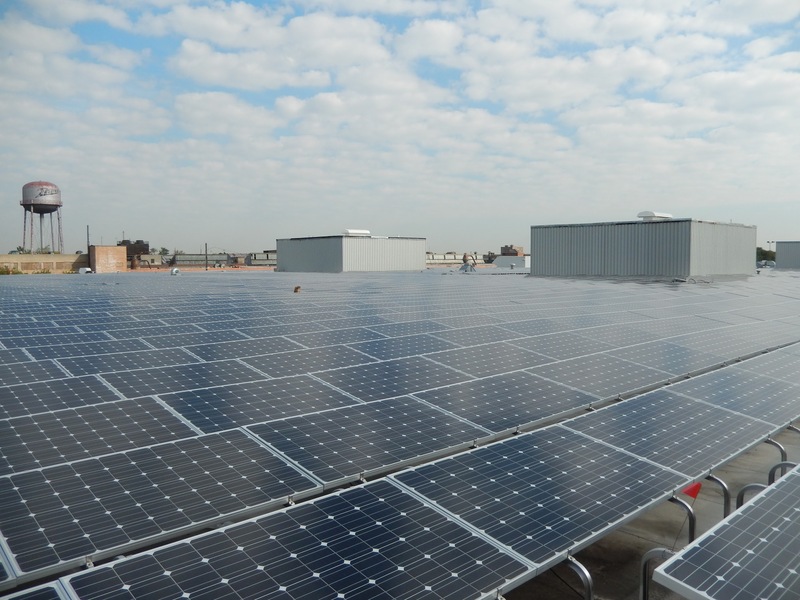 Owners of large warehouses or similar properties with an unobstructed rooftop could also benefit from leasing the rooftop space to a company such as Sunpin Solar that will install solar panels and generating PV power. Many states are offering significant financial incentives for such projects. In the past, solar energy could only serve the common areas on multi-tenant properties. This is no longer the case. The recent introduction of “virtual net metering” allows individual tenants to benefit from commercial solar systems – the result is an opportunity to present higher rents, and this provides an opportunity to extend a tenants lease with guaranteed energy savings cooked into the terms. For CRE developers who do not want to take on the costs of owning and operating installed solar, an Operating Lease is also a popular option that allows for quick ownership of the solar asset without a large output of cash, and often a lessor is relieved of equipment maintenance. Another popular option is a Power Purchase Agreement (PPA) in which a third party developer, such as Sunpin Solar, owns, operates maintains the photovoltaic system and charges a set rate for electricity. Even if a property is not suited for solar installation, a building can still benefit from other large-scale solar projects through wholesale solar energy sales. Cost of wholesale solar has dropped dramatically and where this used to be an obscure option, the CRE industry is starting to take advantage of this through local community solar projects, municipal purchasing or off-site solar procurement. Sunpin Solar, one of the nation’s leading solar development and investment companies has completed several successful CRE projects. The Austin Rooftop Solar project , a rooftop solar installation in Chicago, Illinois is one of the largest rooftop solar systems in the Midwest. It is not only saving the building owner money but is helping the state meet its sustainability goals. Contact Sunpin Solar today to learn your options to get started saving with solar energy!